Put some pizzazz into your pre-party marketing! Designed to catch eyes, the Robot Jack & Jill Club Flyer will pop in postboxes and anywhere else you distribute them. 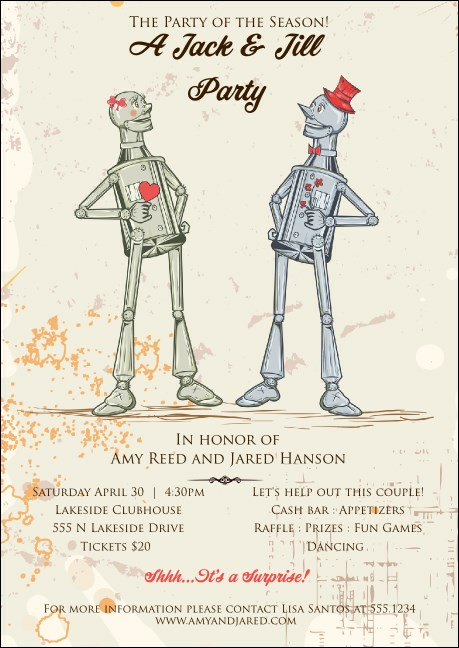 Timeless typeface conveys event details, while a pair of smitten robots make it clear there’s love in the air. Charmed by this design? Check out its matching event tickets, postcards, raffle tickets, and more. Measures 4.25" x 6”, approx. Find just the right posters, flyers, and club flyers for promoting your event on TicketPrinting.com.